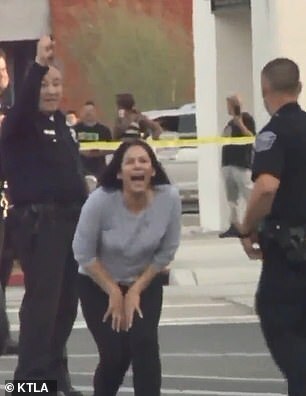 A man was arrested after authorities say he shot dead the mother of his child during a custody exchange at a California police station. The fatal incident took place at around 6pm on Sunday outside the Hawthorne Police headquarters. The 27-year-old victim, named as Brenda Renteria this morning, died at the scene from a shotgun blast. A relative of the victim, who witnessed the shooting, was seen breaking down crying in scene pictures as she was comforted by an officer. Lt. Ti Goetz said an officer who heard shots from inside the station rushed outside, spotted the 31-year-old suspect and opened fire. 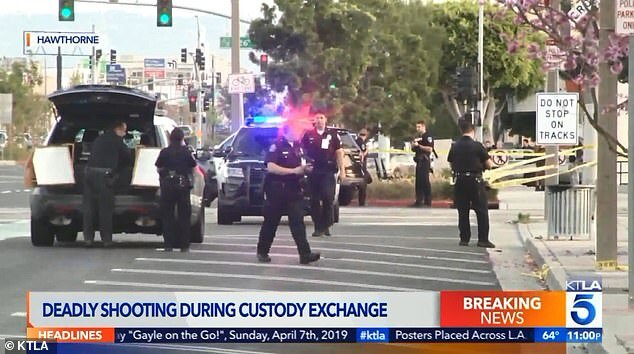 Goetz said the gunman, whom police identified Monday as Jacob Munn, initially fled but was arrested in Hawthorne later that night following a manhunt, reported KTLA. The couple’s 17-month-old child was present at the shooting but was not physically hurt. She was reportedly inside the police station at the time. According to investigators, Renteria had gone to the police station on Hawthorne Boulevard to pick up her child from the child's father. While standing outside the lobby of the police headquarters, the parents began arguing. At some point during the exchange, Munn allegedly produced a shotgun and fired on Renteria, killing her just steps away from the front door of the police station. He then jumped back in his black Chevy pickup truck and sped off, police said. The vehicle, with a small cross hanging off the rear-view mirror, was later found abandoned in a Denny’s parking lot half a mile south of the police station, but the suspect was nowhere to be found. It took police about three hours to track down the man, who was taken into custody in the 4400 block of 134th street in Hawthorne, not far from where his pickup truck was found, at around 9.15pm. A relative of the slain mother told NBC Los Angeles she and the father of her child had decided to meet in Hawthorne because it was a middle ground between their respective places of residence.